The president of Dublin City University (DCU), Prof. Brian MacCraith, delivered a lively and informative lecture Monday night at St. Patrick’s College. His topic was Envisioning the Future of Education. And what a visionary President MacCriath is — I learned so much from his talk! I’ve not got time enough to explain all I learned; I’ll include snapshots of some interesting slides at the end of this post. I’ll explain a little in each caption. I did look up one of the sources he used, as it ties to my map-tracking. 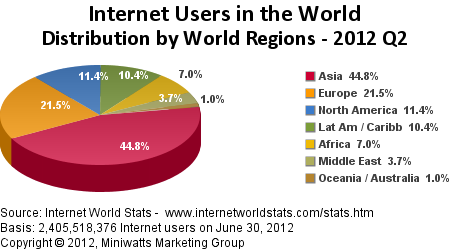 Internet usage by continent (downloaded from Internet World Statistics). One chart he showed (above) helped explain why my blog gets fewer visitors from Africa than Europe and North America. In Africa, just 15.6% of people have Internet access. In Asia, though, there are more people with Internet than on any other continent, so why is my Asia map so blank? Still no one from China…. 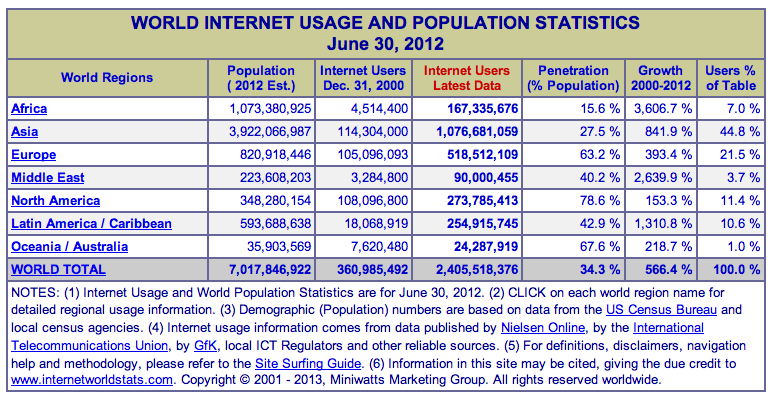 and of the world population of Internet users, most are in Asia. The population of North America (shown in blue on the pie chart) is tiny. As you can see above, not that many people live in North America, even though 78.6% of them use the Internet. Brian’s title slide. I also heard him speak for the introduction of Hillary Clinton, held at DCU in December. Brian’s talk covered these topics. This quote is a hoot! How ironic. Singapore has been rated as the world’s most globalized country. Ireland is #2. Brian notes that’s #1 in the Western world. Brian thinks online education (MOOCs,, like the one I was part of last fall for SCUP) are going to be very important in the future. He thinks 2013 was a turning point in this. The New York Times agreed. The size of each word shows how much involvement Internet-education provider Courseara has from various countries. This slide describes the type of research I do. A model of the beautiful campus of St. Patrick’s College. DIT and St. Patrick’s have these signs hanging everywhere. Students can easily get a visa to come work int eh USA for a summer. It’s called a J1 visa. Irish students are well educated and they speak English — making them prime candidates to work in the US.